Imagine getting a daily paycheck -- or cashing out whatever money you've already earned from your job. It would mean no more strain waiting for payday. Most people continue to get paid every two weeks or even once a month, even though the technology exists to pay people in real time or as often as they'd like. "It's not a technology question," said Jim McCarthy, who helps develop high-tech payments at Visa. "Money is fundamentally becoming digital." So why hasn't money caught up with technology? Businesses are stuck in their old ways, sorting through paper stacks to pay their bills. That sluggish approval process -- office manager gets a paper invoice, CEO personally signs a paper check, it gets mailed -- is too ingrained in the business model right now. That's according to René Lacerte. He's the CEO of Bill.com, which helps small businesses digitize and automate how they pay their bills. Think of a business transaction as a huge iceberg, he said. Payment is just the tip. "Everything below the waterline is the process that businesses have in making decisions," he said. "Everywhere you go, it's a paper-based process." Right now, businesses are flooded with incoming invoices. And contractors normally find themselves getting paid late, which in turn slows down how contractors pay their own employees too. With that chaos, companies are hesitant to speed up paying their bills. Only 2% of companies that join Bill.com use the next-day bill pay feature. Convincing them to pay employees and vendors on a daily basis would require completely ditching the existing payroll system. Meanwhile, banks are slow at processing transactions. Retailers have to wait several days to actually receive the money a customer spent when they swiped their credit card. And even when businesses make "instant" bank-to-bank transactions to pay employees or bills -- it's not really instant. Banks rely on something called the Automated Clearing House system, an interbank payment network that dates back to the 1970s. ACH transactions only get logged a few times a day in massive batches. ACH has several daily deadlines that seem terribly outdated. For example: Make a payment by 2 p.m. E astern Standard Time -- or it won't go through until tomorrow. That delay is the biggest frustration to businesses right now. SurePayroll, which caters to small businesses, sees it first hand. It watches businesses take out money on Wednesday to pay employees or a bill Friday, needlessly extending the time they're short on cash. "Right now, the process pulls out the money too soon and gives the money too late," said Steve Kania, SurePayroll's vice president of strategy and product management. "The only people who would want to lag that time is banking, where they collect interest on the money that they move slowly," Kania said. Major players are already working to solve these problems. Visa (V) is tapping into its worldwide electronic network to start making near-instant payments called "Visa Fast Funds." Instead of dealing with ACH deadlines, it moves money directly from one debit card to another. By the end of 2016, the company thinks 96% of Visa debit cards will have the Fast Funds feature. It says Facebook (FB) and Square are already using this system, absorbing the Visa fee and offering it to customers for free. This is how ride-sharing service Lyft lets drivers claim their paychecks on demand, Visa said. Lyft now lets its drivers cash out every time they've earned at least $50. Then there's Square (SQ), which has an "Instant Deposit" feature for customers that get paid using Square Cash or its credit card dongle. "A contractor remodeling a bathroom could get a down payment, then use that to buy supplies and tiles to do the job that day," said Brian Grassadonia, head of Square Cash. Another way to really speed up money is to reduce risk of fraud. The digital money system Bitcoin, which is still quite experimental, does this through an instant fact-checking accounting system called the blockchain. "Bitcoin has created the only real-time engine for moving value," said Micah Winkelspecht, whose startup Gem installs Bitcoin technology for internal use at major American banks. Bitcoin isn't catching on as a digital currency. But it is being used successfully to quickly settle payments. Circle, a money-sending app that works instantly, conducts trades in established currencies like dollars and euros. But on the back end, it's actually moving them across the Bitcoin network. 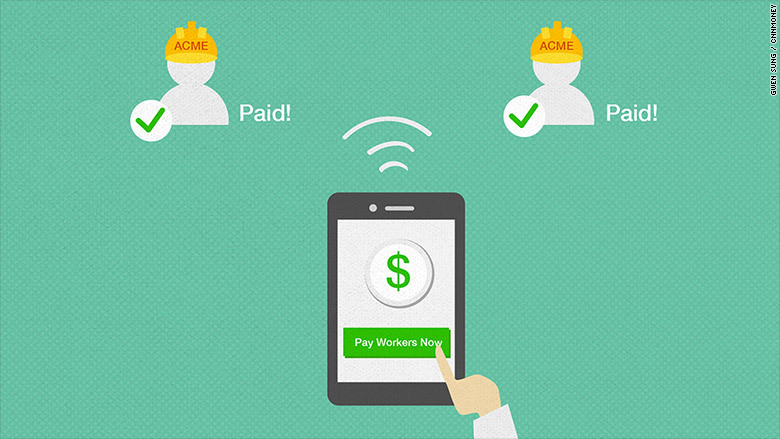 Circle CEO Jeremy Allaire thinks that person-to-person payment apps will be the catalyst for faster paychecks. "When people start experiencing personal payments the same manner they do with email and text, consumers are going to start saying, 'Why can't my company pay me this way?' It's going to be a consumer led phenomenon," Allaire said.